Being a student means living on a limited budget. Thus we provide the students with a 20% discount!!! If you love eating out, we have a variety of meals and snacks that will engage your taste buds. Our food is made by using the best and fresh ingredients giving it the taste that you will remember and crave for more! 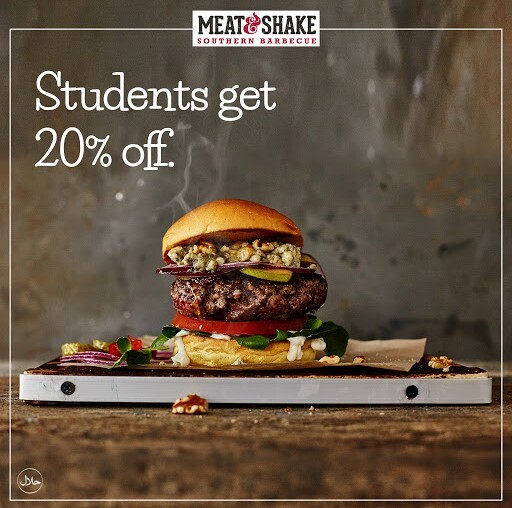 Let’s enjoy being a student at Meat & Shake by indulging in lavish food. Show us your NUS card anytime, for a 20% discount off our menu. Keep calm and eat an excellent lunch meal. 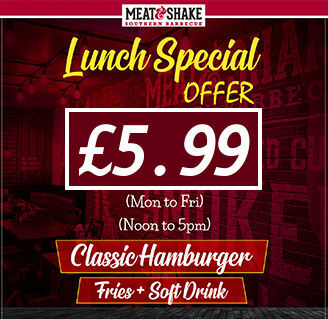 Our lunch menu just got more exciting, Make a meal for only £4.99 that includes a burger, fries and soft drink. This deal is valid from Monday to Friday. Visit our outlets in Watford, Tooting and Ealing during 12.00 pm to 5.00 p.m to avail this offer! The perfect excuse for a delicious feast with your whole family, don’t miss out on a fabulous February half term break this year. Your kids study hard throughout the term, and they deserve a nice outing. If your child is a picky eater, he will love our meals. You will love our half term offer! 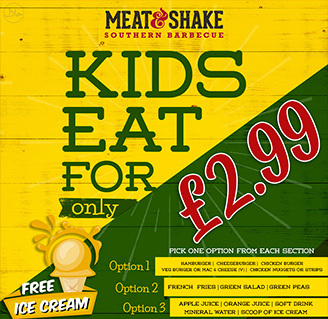 Our menu is designed explicitly making sure that the kids find their food delicious and nutritious for just £2.99. P.S: With every kid’s meal, we offer free ice cream cone. On this Valentine’s Day, we are serving love on your plates. 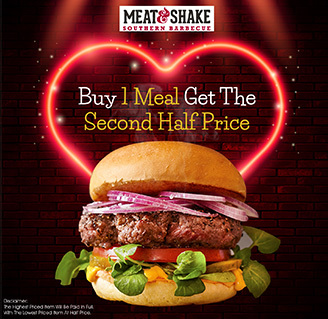 We make your 14 February more special at Meat and Shake by giving you an exclusive discount. Buy one meal and get the other one for half the price. Let your loved ones feel special this Valentine’s Day with our delicious and mouth-watering burgers and steaks. Our food is made from fresh ingredients that provides a unique flavour that you won’t be able to resist it. What are you waiting for? Grab this fantastic offer by making reservations in our outlets at Watford, Ealing or Tooting.